The sights of Rome are so numerous that not each and every one can be taken in- rather only the most important and interesting. Thus, for example relatively few people know that one of the many epithets of Rome – ‘City of Obelisks’ comes because the Romans during their rule over the ancient Egyptians, brought many of theses stones back with them as a sign of victory and erected them in public places. One of the most important ancient monuments and landmarks of the city is the Colosseum. At its time it was the largest amphitheatre in the Roman Empire and was built in an astonishingly short amount of time from 72-80 AD. It is astonishing when one considers that at that time no modern machinery and lifting equipment was available. Book your flights today to enjoy one of the most identifiable symbols the city of Rome has long been famous for, the imposing Colosseum located in Rome's historic city centre! The Colosseum is considered as one of the greatest examples of Roman engineering capable of seating over 50,000 spectators and is a marvel of architecture with its unique design and elliptical structure. Tourists and first time visitors to Rome never fail to be amazed at the sight of the Colosseum and this is why it is acknowledged as one of Rome's most famous and visited attractions. According to the latest research the arena could even have been flooded to re-create naval battles. 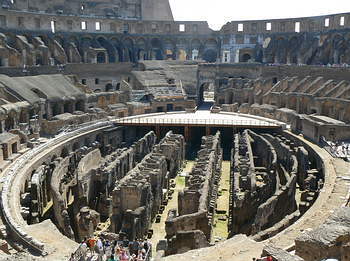 The Colosseum gave host to more than 50,000 spectators. To protect against the scorching heat of summer the arena could be kept in the shade by the use of specially constructed sun-shades; a state of the art technology that has only been utilised again in more modern sports stadiums. The bloody gladiator fights and the mock battle scenes were very popular amongst all levels and classes of Romans. Also it was here that many of the first Christians were cruelly executed and died the death of martyrdom for their beliefs. During the time of the Ostrogothic Kingdom of Theoderic in the year 532 the last of the games were held in the Colosseum. Later the building complex fell into disrepair and during the middle ages and the period immediately after it was used as a quarry. This practice was only stopped by Pope Benedict XIV who because of the many Christian Martyrs, who were slaughtered there, secured the building from any further demolition in the year 1750. 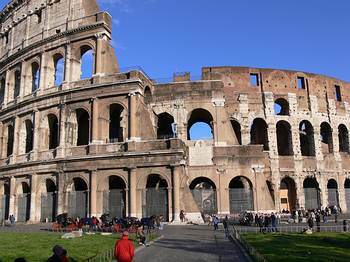 Today the Colosseum is one of the main tourist attractions in Rome open to the public. It is opened daily – in summer between 9.30- 19.30 and during the rest of the year till approximately one hour before sunset. The entrance fee is a few Euros with discounted rates for students. There are also guided tours and special exhibitions that can be visited for a small fee. The Colosseum is very conveniently located and can be easily reached via the metro – Line B alighting at Station Colosseo, or using the Bus- route 75, stopping at Piazza de Colosseo.